Di Blueprint Band is now the ‘Best New Band in the World’ having won the World Finals of the Global Battle of the Bands competition at the Scala live music venue in London Sunday, December 9, 2012. This is the third time that Jamaica has sent a representative to the World Finals and the second time that Jamaica has walked away with the championship trophy. 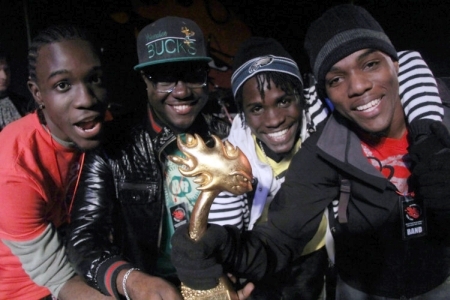 In 2011 the statuette was won by the Dubtonic Kru and this year was the turn for a four member band of students from the Edna Manley College of the Visual & Performing Arts. Di Blueprint Band is comprised of Kedron Kennedy the bandleader and drummer, Vern Hill the musical director, Elton Brown the guitarist and lead singer along with Alex Gallimore, the bass player and lead singer. The band competed against 13 bands from around the world including bands from Romania, Iceland, Cyprus, Australia, Norway, England, Finland, Malta, Scotland, Bahamas, Ireland, Greece and Lebanon. There would have been 18 bands in the finals however 4 of the bands were refused visas. Three thousand bands competed in the Global Competition with some countries having as many as 500 bands in their local competitions. This world finals was historic for the Caribbean with the entry of the Bahamian group ‘Stinkin Ways’. The judges made their announcement at the end of the bands performances and the performances of the guest band. The country ranking was as follows: Sixth Cyprus followed by Norway, Australia, Bahamas, Romania, and Jamaica in first position. Di Blueprint wins a $100,000 USD developmental package that will include production, marketing and touring along with cash.